How will this impact your solar project? The new tariffs will apply upward pressure on prices for solar projects. In fact, prices have already started to increase as of the spring of 2017. Following years of consistent price drops, the cost of modules began rising, largely due to the increase in demand as companies stockpiled modules in advance of the ITC ruling and subsequent Trump Administration decision. To understand how solar tariffs will affect the overall cost of solar projects, it is important to understand the balance of system costs for utilities. The breakdowns below correspond to residential (5.7kW), commercial (1MW), and utility-scale solar projects (100MW). As project scale increases, hardware increasingly dominates total system cost, currently accounting for more than half of the cost of utility-scale fixed tilt systems. Modules account for about 35% of the total cost of these installations compared to just 12% in a residential system, largely due to increased purchasing power, business efficiency, and economies of scale in installation labor. An increase in hardware costs can erase the already thin margins for utility-scale installations which must reliably produce power at wholesale prices. Utility-scale projects will feel the brunt of the price shift, as modules make up 35% of their total costs. The tariff and quota will initially impose a 30% increase on the price of modules and cells, could increase the total installed cost of solar power for utility-scale fixed-tilt systems by as much as 10%. How can you plan and prepare for tariffs? It can be challenging to plan and prepare for utility-scale solar projects, especially in the face of changing laws. Here’s how you can better understand and negotiate pricing. Know the Hidden Commodities that are Driving your Cost - Outside of tariffs and quotas, there are many other factors that may impact pricing. In an industry reliant on volatile commodities, it’s crucial to know how movement in the market can impact cost. Should-cost modeling can help pin point these risks or opportunities. For quick visualizations, exposure mappings like the one below can also aid in identifying key commodities. This feature in PowerAdvocate’s Cost Intelligence solution has adjustable time frames and shows our expectations for future commodity price movements. Block size represents exposure to a given commodity as a percentage of total facility cost. Color intensity corresponds to should-cost escalation, with larger redder blocks indicating more risk, and larger greener blocks indicating more opportunity. 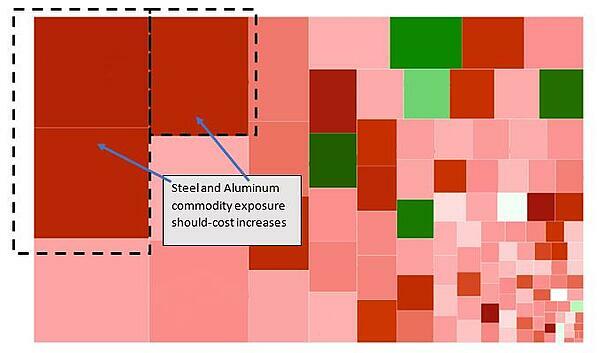 In this example, High-grade aluminum and steel are shown to have significant price impacts due to their overall size and relative price movement since October 2016. Negotiate with Suppliers – The 2017 anticipatory stockpiling of solar cells and modules coupled with the 2.5GW annual pre-tariff import quota creates a buffer from which market-price escalations are shielded. While new imports may eventually be impacted by the 30% tariff at some point this year, the overall market price is not expected to spike too drastically. Be aware of this when going over any price increases from your supplier. Negotiate your contracts leveraging should-cost models and exposure mappings mentioned above. Additionally, shifting the timing of your purchases may reveal lower prices and considering contract structures which lock in pricing or tie price changes to fixed indices can limit your exposure to any major price swings in the future. Manage Supplier Relationships – Collaborate with suppliers to understand if there are alternatives. In fact, some suppliers have the option to shift purchases to a GSP country, while others are building manufacturing plants in the United States, meaning their prices will not be subject to this 30% import tariff. Alternatively, American solar equipment could become more price competitive and may present a more viable option than in the past. Make sure to consider all suppliers and source competitively to gain insight on the most viable option. Seek Advice of Industry Experts – Even with internal and external analyses such as should-cost modeling, there is still a level of uncertainty when managing large solar projects. Bringing in external consulting groups can ensure your organization is maximizing savings and making informed decisions based on a breadth of in-depth analyses. PowerAdvocate is uniquely qualified due to our extensive history supporting numerous utility companies coupled with our overall focus on the energy industry. Our consulting practice helps energy clients design organizational approaches, leverage market data to estimate and forecast project costs, and procure and negotiate labor and materials contracts of any size. In today’s uncertain environment, new legislation such as tariffs and subsequent market jumps are the new norm. It is now crucial to plan and predict for these changes. Implementing the guidelines outlined here, including using cost models, being aware of project cost overrun risks or savings opportunities through price de-escalations, and seeking advice from industry experts can help you mitigate the impacts of changing regulation. Start preparing to mitigate potential cost increases from these new tariffs today.